I was in an elevator in Boston one night, and a guy asked me about the brown and tan low-top sneakers I was wearing. "Nice sneakers," he said. "Where'd you get them?" I looked down, thought for a moment, and replied. "Target." The revelation that I was wearing mass-market Mossimos resulted in obvious disgust on the man's part, and he departed when the doors opened, while I pondered my fashion faux pas. I have never cared much about the shoes I've worn, as happy with the expensive Nikes my wife bought me shortly after we started dating as I am with the $15 Starburys I got from the late, great and severely-missed Steve and Barry's. The way I look at it, shoes are constantly touching the dirty, dirty ground, so to spend a lot of money on them is a massive waste. So, as you might suspect, I am certainly not a sneakerhead. 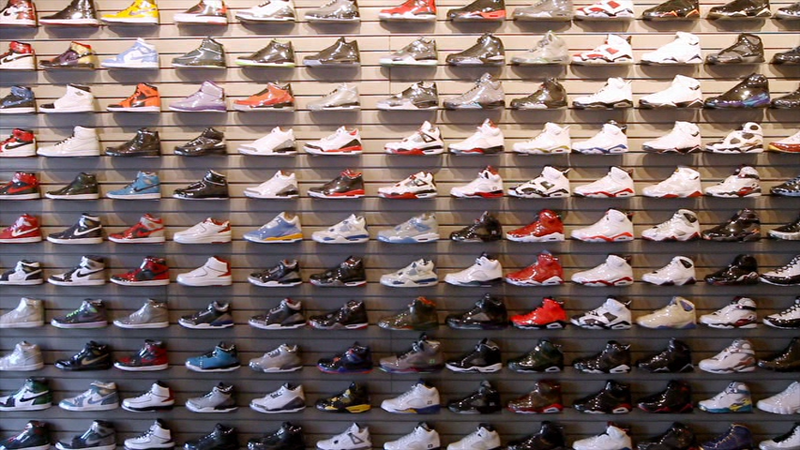 Sneakerheadz invites the viewer into the subculture of sneaker collecting, explores the many nooks and crannies of the industry and looks at some of the big issues at play in the world of sneakers. 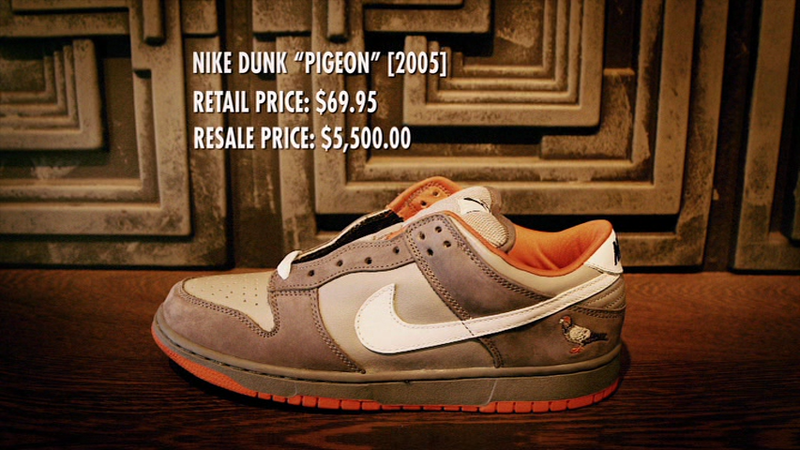 Directed by first-time documentarians David T. Friendly and Mick Partridge, the film does an excellent job of filling the audience in on a world they may be completely unaware of, complete with a glossary of terms that will be used (like "dead stock") and an efficient history of the sneaker industry, from its early days, through its evolution alongside hip-hop and to the still-growing collectors market. The information is clearly laid out, through narration and talking-head interviews, as well as graphics influenced by sneaker boxes. Knowing this world only on a surface level, the film was hugely informative to yours truly. The cast of participants includes several faces you might know, including TV personality Rob Dyrdek, musician Wale and professional baseball player Jeremy Guthrie (the last two also acting as producers of the film), and a host who will only be familiar to sneakerheads, like designers Frank the Butcher and Jeff Staple, but they are all die-hards when it comes to sneakers, and they bring expert perspective on this world, as the film paints a clear picture of sneaker collecting as a business and an addiction, focusing on its two main hubs, the U.S. and Japan. Far more a love letter than an unbiased exploration, Sneakerheadz doesn't ponder too long on the sheer commercial nature of sneaker collecting, the market manipulation on the part of the manufacturers and the threat of crime that frequently accompanies the business, as the need for high security for many of the collectors is glossed over (or even joked about) while only a brief segment looks at the riots that have occurred at sneaker releases and the violence that's befallen sneaker collectors. It's not likely a coincidence that this segment is followed quickly by a piece about kids with severe illnesses who get to design sneakers and what the opportunity meant for them. Acknowledge the elephant in the room, but point out that it does good stuff too! One of the real challenges the film faces and tackles well is taking something as static as a sneaker and making it dynamic. Through some stylish design (with the introduction of rare sneakers and their price tags being an enjoyable diversion) and a group of interesting participants, as well as plenty of footage of collectors and their shoes, the documentary rarely stands still for very long, which ensures that the topic, which is not particularly deep in subject matter, doesn't overstay its welcome, while those without a stake in this world won't lose interest. Sneakerheadz, arrives on one DVD, packed in a standard keepcase. The disc has a static menu with options to watch the film, select chapters and adjust the set-up. There are no audio options, while subtitles are available in English SDH. The Dolby Digital 5.1 track's main job, aside from delivering the film's voices clearly and without distortion, is offering the energetic, hip-hop-focused soundtrack a boost in the surrounds. The film doesn't boast the most dynamic sound, with some atmospheric fill, but the music carries the day, keeping the momentum up from scene to scene. This is a FilmRise standard edition DVD. Standard means you get nothing. Good day, sir! I could care less about sneakers or their collectors, and I find the entire idea of paying boatloads of money for sneakers or fetishing footwear to be asinine. 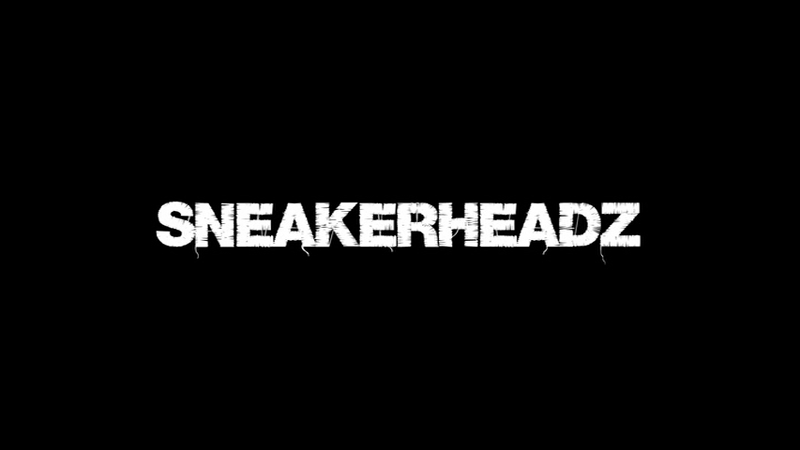 However, Sneakerheadz is so well-made and so polished, while also being loaded with interesting subjects, that I never felt bored during its breezy 74 minutes and found myself interested in this odd world of limited editions and financially-motivated assaults (even if the idea of collecting shoes still seems dopey.) The presentation on DVD is solid, though there are no extras, so if you don't buy two pairs of sneakers at a time, a rental should cover you, through the movie is better than that.